Thinking about strategies of how to best edit web content, we will rather quickly agree that the so-called inline or inpage editing is the best way to do it. 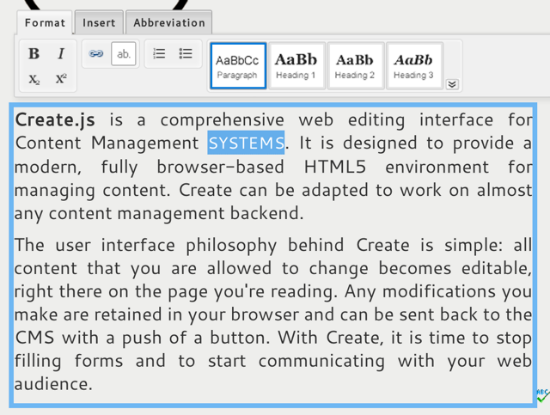 Inline editing means the editing of web contents right inside their original layout. Still this best way is supported by only very few systems. The project Create.js provides a module for almost every CMS out there to relatively easily implement exactly this, inline editing of any content. Create.js decouples editing, framework and content, thus establishing another layer to the formerly two-fold website concept. The advantages of such a modular system are obvious. As long as the modules stick to established standards they can be changed easily. Innovations are accelerated, at least potentially, as no market participants can gain lead over one another, simply by being in a pole position. Create.js works with RDFa annotations to define the editable areas and uses a RESTful API to store the edited content on a remote server. This way, the whole process is transparent and conforms to given web standards. Licensing problems are not at stake. 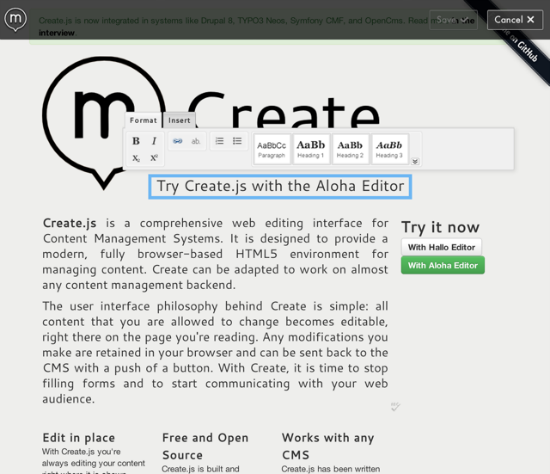 Create.js uses the Hallo editor, optionally Aloha is available, too. Create.js and Hallo are available under the very liberal MIT license. At the server-side Create.js relies on Backbone to populate its Models and Collections with the edited contents, then generating Views from it. This way front- and backend stay synchronized. Besides of Backbone, Create.js relies on jQuery, jQuery UI, Underscore and VIE. Lead developer of Create.js is Henri Bergius. The development is partially funded by the European Union in the context of the IKS project. The IKS project is supposed to make semantic technologies available to common CM systems. In case you didn’t know, one of the core WordPress devs has a plugin which incorporates this project. That said, this project is still buggy for WordPress editing on the front end. I can recommend it for most typical editing but don’t be surprised if it gets in the way sometimes.